A huge, gaping cave has been discovered hidden in the remote Canadian wilderness, and despite the overwhelming scale of this stunning natural void, researchers suggest it may never have been seen by human eyes before. Nicknamed the ‘Sarlacc Pit’ after the monstrous pit-dwelling beast in Star Wars, the giant cave – concealed amidst the rugged terrain of British Columbia’s Wells Gray Provincial Park – is so vast its effectively unbelievable, explorers say. “My immediate reaction was that there can’t be a cave there, it’s impossible,” geoscientist Catherine Hickson, who conducted an expedition to the site in September, told Global News. While the accidental spotting was lucky, what’s more remarkable is that this massive void had somehow managed to escape detection before this – a seemingly unlikely result for a cavernous mouth that measures some 100 metres (328 ft) long by 60 metres (197 ft) wide. And that’s just the size of the hole at the opening. If you’re daring enough to approach the perimeter of the cave and gaze into the abyss – like surveyor and speleologist John Pollack did during the September expedition – the cave’s true enormity becomes apparent. “I’ve been in some of the biggest caves in the world, and this thing has an entrance that is truly immense, and not just by Canadian standards,” Pollack told Canadian Geographic. But if the discovery ranks among the largest caves in Canada, how come researchers weren’t aware of its existence before now? According to Hickson – whose company, Tuya Terra Geo Corp., funded the initial survey expedition – the site in Wells Gray Provincial Park where the cave is located would have been historically buried in snow cover year-round, until perhaps 20 to 50 years ago. Because of that – and its extremely remote, difficult-to-access valley position – she hypothesises the chance finding earlier this year could well have been the first time humans ever laid eyes on the giant cave. Not that they’re claiming it as a fact. To find out more about the cave and its history, the team is appealing to the public to come forward if anyone has knowledge of the void, and are consulting with local First Nations communities to see if the cave exists within indigenous records. Outside the possible scope of traditional knowledge, there seems to be no mention of it anywhere that the researchers have looked – something that makes the snow cover hypothesis look more of a certain bet, they think. 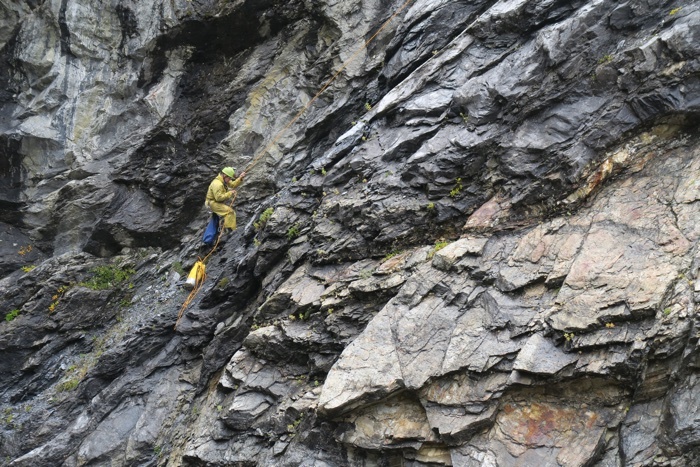 “The entrance is sufficiently notable that descent attempt would have been written up by mountaineers, cavers, or park staff if it had been encountered in the past 40 or 50 years,” Pollack said. There’s also the matter of naming. If First Nations communities don’t have an existing name, an informal contender from a galaxy far, far away – ‘Sarlacc Pit’ – might end up sticking. The nickname, given by caribou biologist Bevan Ernst during the April flyover, may have only been intended as a temporary placeholder, but it’s already the subject of a fledgling Change.org petition seeking to make things permanent. Despite welcoming the public’s enthusiasm, the researchers aren’t disclosing the exact location of the cave yet, in a bid to help protect its pristine, natural environment – especially seeing as scientists haven’t yet had a chance to really study it. During the site visit in September, caver Lee Hollis made the first and only known descent into the cave, abseiling down about 80 metres (262 ft), although the thunderous deluge of the cave’s waterfall prevented further exploration. The researchers estimate the constant surge of glacier melt – up to 15 cubic metres (nearly 4,000 gallons) of silty, abrasive water per second, which courses down one side of the cave’s opening – helped form the natural structure. This waterfall, the researchers think, becomes an underground river that ends up emerging about 2 kilometres (1.2 miles) away, some 500 metres (1,640 ft) below where it enters the cave mouth. Future research – slated for a larger expedition expected to take place in 2020 – will hopefully be able to confirm more details about this long-hidden wonder, which amazingly looks to have kept its secrets from us for thousands of years. “Even in this day and age, when we think we know everything and we’ve explored every place, we can be surprised,” Hickson told Global News.